These are prospects that are sired by the Champion Bulls in the Longhorn Industry as referenced above - These prospects have passed the rigid Helm Cattle culling process and have matured to a point where it is evident that they could also become a future Champion Bull as their Sires. 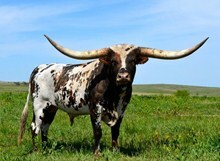 They also have dams of distinction that are producers here at Helm Cattle Company and in the Longhorn Industry. You may click on the prospect for awards, full pedigree etc,,.